Paper Mario is 15 years old today, 11th August, in terms of its Japanese release in 2000. Intelligent Systems, a development company typically associated with Fire Emblem and Advance Wars, took a step back from serious strategising to produce what was, at the time, a bit of a revelation. Actually originally known as Super Mario RPG 2 in Japan, following in the footsteps of the brilliant SNES title Super Mario RPG: Legend of the Seven Stars, Paper Mario utilised the power of the Nintendo 64 to incorporate 3D world design with the self-titled paper effect. It was an early example (but certainly not the first) of Nintendo's desire to produce handsome virtual arts and crafts - the company's loved doing just that in HD with the Wii U, of course. With a neat look came fun RPG and timed button-input battle mechanics, which all combined for a memorable experience. It still stands up wonderfully today, but when celebrating the 15th Anniversary of this game we should appreciate its role in adding another dimension to Nintendo's library. Not only has it spawned three direct sequels of its own on GameCube, Wii and 3DS, but a few years after this title we had AlphaDream's Mario & Luigi: Superstar Saga on Game Boy Advance, itself bringing us three sequels (with another on the way) across DS and 3DS. Until Paper Mario: Sticker Star there'd been a neat divide, in some respects, with key similarities in the franchises being separated by their natural homes on home console and portable alike. Despite the different development teams, the shared humour and approach has always been obvious, which makes next year's Mario & Luigi: Paper Jam on 3DS a natural evolution. Based on our hands-on time so far the blending of the Paper and Mario & Luigi worlds works wonderfully, with plenty of scope for creativity, not to mention the extra challenge of controlling three characters rather than two. To get to the point, I think we have a lot for which we should thank Paper Mario (and Super Mario RPG: Legend of the Seven Stars, of course). As all that know me well are aware - or anyone that's read my bio on the site - I think that Bowser is the best Nintendo character of all. An awesome visual design, yes, but it's based on his goofy personality. In modern Mario platformers we get a taste of it, and in Mario Kart 8 he's got cool animations and sound, but rather like my colleague Tim Latshaw - who wrote our Paper Mario Wii U Virtual Console review - I love his character. That's a character that began to form in Paper Mario and evolved in the sequels. I generally lean towards the Mario & Luigi series in terms of my favoured RPG fix from that cast, but Paper Jam is right at the top of my wishlist due to the fact it's bringing the two together. Paper Mario's biggest strength - which it passed on to its successors - is in its characterisation and writing. In some respects these personalities have existed for decades in Nintendo manuals or company character guides, but it's the way they're portrayed in the RPGs that takes them to a new level. When I played Bowser's Inside Story, a bromance with a spikey-shelled and down-on-his-luck megalomaniac was born. Beyond Bowser, as not all share my obsession, it's these games that really bring Mario, Luigi, various Toads, Peach and more to life and make them loveable characters. They're not just mascots in these games, but cartoon characters and caricatures - wonderful, silly, goofy cast members within colourful tales. All of these qualities are definitive of Nintendo, too. Myself and various others have written in the past that Nintendo's playful, light-hearted approach is fundamental to its appeal. It'll have serious moments in franchises like Metroid and The Legend of Zelda, sure, but even the likes of Zelda or Fire Emblem punctuate world-ending story lines with bizarre characters and quirky realities. This has been the Nintendo way since its beginnings, but purely in the Mario landscape Paper Mario deserves to be revered for its key role in sharing that side of the Mushroom Kingdom - and beyond - with gamers. The writing teams of the development studios, and then brilliant localisation crews, have brought real treats in these RPG games, titles that divert our attention for hours with blasts of colour and daft humour. Sometimes the characterisation even helps disguise little flaws - Mario & Luigi: Dream Team dragged a little beyond its welcome in core gameplay, for example, but its cast kept me hooked. With Paper Mario available on N64 carts, the Wii Virtual Console or the Wii U Virtual Console, perhaps it's worth revisiting the classic experience. I defy anyone to play through it without raising a smile. I hope Paper Mario and the Thousand Year Door gets a re-release on the Wii U.
Wanna know what would have been great? A true, console Paper Mario game to celebrate but... we get a 0.3 paper mario game. I love this game. The only game better in the series is Thousand Year Door. Shame it went downhill so fast after that one! It always throws me off Nintendo even seems a gen behind with their anniversaries. When we had the Super Metroid 20th anniversary, it didn't seem so crazy that game was 20 years old when we'd already had the 20th anniversary of Tekken and Ridge Racer earlier in the year. And again with this. Some of the 'wow' of the 15 years is kinda taken away when we've already had the 15th anniversary of games like Shenmue and Jet Set Radio. I am ashamed to say that although I own all of the Paper Mario games released to date, the first one is the only one that I have actually played through. My gaming backlog is ridiculous. I need to stop collecting games. Always felt these games had way too much dialog even by JRPG standards. I'm 2/3 the way through Dream Team and they're STILL releasing new mechanics which means a constant flow of tutorial moments. You never really feel like you've mastered the games even close to the end. A wonderful whimsy they ONCE had. At first, I wasn't excited for Mario and Luigi Paper Jam at all, but after reading this article, I realized how much I love both those series (except for Sticker Star). So thanks Thomas for making me excited about this game! Aw man, if I'd known this was today I would have made a video about it! Well happy birthday, Paper Mario. 15 years of paper (and 11 years of waiting for a proper third entry). Can't wait to play Paper Jam! Hopefully it's good and won't be a let down like Sticker Star. Paper Mario 64 is great, The Thousand Year Door is even better, Super Paper Mario is okay, and I didn't even bother with Sticker Star. Hopefully Paper Jam turns out to be a great game. Too bad it looks like there won't be a Paper Mario game on the Wii U. On a side note, why is fan art for the partners being used here? I'm a big fan of Thousand year door and Super Paper Mario. The others are good too. I only played (and finished) Thousand Year Door and absolutely loved. I was so addicted to that game! The first two Paper Mario games were the best. Happy Birthday to an incredible series. Yes, ALL of the series is good. The first 3 are just better. First two were awesome. Great worlds, setting, characters, etc. Super Paper Mario is alright, and just as humorous. Sticker Star... felt like it tried to be a failed hybrid. Hopefully the next one tries to dethrone Thousand Year Door as the best. So much that can be advanced, improved, etc. 15 years already? Oh my, how time flies by. I remember it like it was yesterday. I played the three console ones. I'd love another entry in the series. On the Wii U that is. I've always had a hard time deciding on which game from the Paper Mario series was my favorite but I think I've decided now that it was Super Paper Mario on the Wii. It just had so much character and the mechanics were so fun. I just honestly loved the whole game. @ikki5 it's better than nothing. I'm sure we will get something in the near future. Maybe they're scared to make another one after the fan reception to Sticker Star, or maybe they're waiting to make one for the NX. I've been playing Sticker Star lately, good timing on my part. Very excited for Paper Jam. Hopefully they'll announce a new PM game in the near future.it hasn't skipped a home console since the N64, so it wouldn't make sense for it to skip the Wii U, Ah well. Happy birthday to the paper-clad mustache man! I absolutely love paper mario 😀 the thousand year door is truly an amazing game with one of my all time favourite section in - the glitz pitz that place is just so amazing and blew my tiny mind!! As for Mario and luigi? They're okay lol they're too easy and have too much talking for my liking to be honest. @gatorboi352 I (and many others, I'm sure) are getting sick of your constant negative remarks. If you hate Nintendo so much, then leave. Mods, do what you will, but it's something I feel needs to be said. On topic; I can't believe it's been 15 since Paper Mario came out. I still remember getting it ordered via my video store, as I was paranoid that I wouldn't be able to buy it in stores... Turned out I was right, as the game got a limited release in Australia, and I lived in a small town which had virtually no games to purchase. This was pre-internet days, and the only way to get the games I wanted was to order them over the phone or ask a shop clerk. Still, I got the game, and played it non-stop over Christmas. Good times. BACK OFF Sticker Star. Casuals like me enjoyed it! @DreamOn Sticker Star honestly is the most challenging entry in the series.and with the best level design. Pretty great as an adventure game in my opinion, much better than broken age. Paper Mario was fun, but its sequel is lots better. A very big and awesome game. The first area (the port-town) already was teeming with secrets. I want something on that scale again Nintendo, with plenty of new ideas! @efaulk84 OH OH!!!!!!!! I WISH THAT TOO!!!!!!!!!!!!!! Super Star Saga and Thousand Year Door are one of my Favorite RPG's of all Time......man, Nintendo just can't bring back Paper Mario like how they used to. oh well....atleast the Mario and Luigi series is amazing! PM (which was one of the first games I played, and my first RPG which is now my favourite genre) and TTYD were both great, SPM was a great game but a bad paper mario, and SS was just a bad game period. Haven't finished any M&L game yet. Really hope they either re-release TTYD (in any form, VC or remake) on the Wii U. Why do people hate on Sticker star and Dreamteam Bros. I have yet to play the first game but all the of the others I did enjoy quite a bit. If Sticker Star wasn't quite as reliant on utilizing particular stickers on the bosses then it would have been truly an excellent game but as it is it was still pretty good, not nearly as bad as people would lead you to believe. I do think TTYD is my favorite out of the bunch though. Yay! But could we possibly have a "back to basics" gimmick for the next one, i.e more like the first 2? I enjoyed the N64 Paper Mario and the first Mario & Luigi game (never played any other games in either series) but nothing, and I mean nothing, compares to Super Mario RPG in my eyes. That game is perfection. I enjoyed all four Paper Mario games very much, with the first two being gold to my eyes. I'll be honest and say that I did kind of expect Paper Mario Wii U to be on e3 2015 (which I thought was okay, in my opinion). I guess Paper Jam will have to do for now, despite me not being as thrilled yet. Hopefully Intelligent Systems will make Paper Mario Wii U (a traditional RPG that plays like the first two while bringing back ideas from SPM and SS), one of these days. 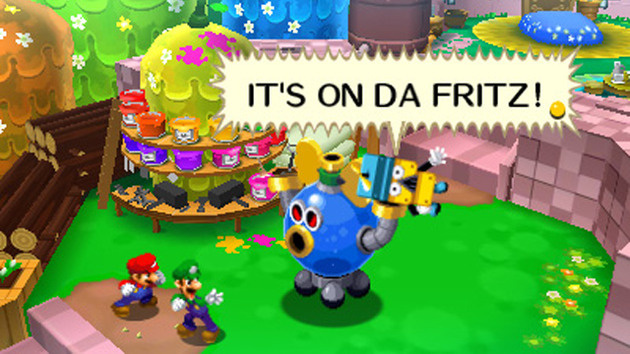 It seems to me that the Mario and Luigi series knows what kind of game they are, and has fun with it. Paper Mario after only playing the super paper Mario and sticker star seems to have an identity crisis of what kind of game the paper series wants to be. Still need to sit down with the original (in my endless backlog) and give it a shot. Get the feeling it will make me mad about the last two lol. @Dr_Lugae LOL WHAT!? It was literally 'get x item, you win'. Did you beat the desert boss pokey?? Like, it would literally tell you what you needed to get if you died several times while facing him, he was really good for a world 2 boss but he wasn't even a challenge if you had the right item (and experimenting wasn't even encouraged as it would give an obvious hint at the right thing to use). Stuff like that absolutely plagued the game pretty much everywhere. I wonder if the eShop will be running a promotion on these games, I haven't tried any of them but would like to start. Too bad Paper Mario Sticker Star wasn't as good as I thought it'd be. C'mon Intelligent Systems. You won't make Advanced Wars but you'll make STEAM? You'll make one of the best Metroid's but won't step up to make another during the 5 year gap? Get yo head in the game. JUST DO IT! I feel old because all I can think of reading this is "Ah, the good ol days". Modern Paper Mario doesn't excite me at all. Mario & Luigi feels like it's on a downward slope too. I'm sad. Great game on the N64 and the Gamecube sequel. I didn't like Wii Paper Mario as much, felt it lost a lot of the charm and gameplay that made the previous ones fantastic. Great humour, many laugh out loud moments and good character development. Don't think I will play Sticker Star unless I see it very cheap to tempt me. Hopefully will get time to play the N64 and Gamecube versions again. Cool, it has the same birthday as me. I still need to play some Paper Mario at some point though. I own this game on the virtual console thanks to Club Nintendo, but I unfortunately started the series with Thousand Year Door. 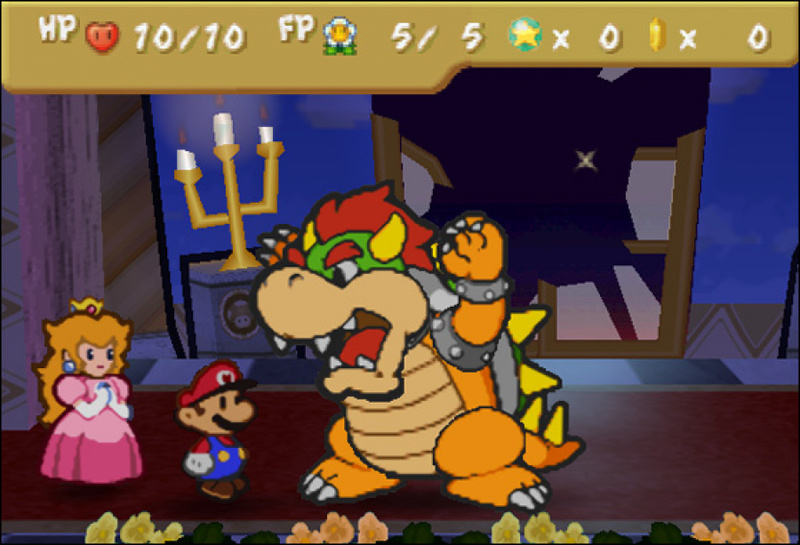 I've managed to struggle through Super Paper Mario but haven't been able to do the same with the original. There is just something about N64 games that bothers me. This might have been my first RPG and this game influenced me so hard, and it probably changed the way I think about the Mario universe more than I realize. @Yellowkoopa That's from SuperStar Saga. Popple's in the background toward the left. Anywho, I think we are WELL due for an HD Mario RPG, and since Squeenix is talking about Dragon Quest X and XI as well as a possible Final Fantasy(WOW, it's been a while since that touched a Nintendo console), maybe they can seal their love letter with a kiss of an ACTUAL Super Mario RPG 2. Maybe not for the Wii U, because it looks like that ship's sinking fast, but for the NX. @MrPuzzlez I was referring to the first picture, with the Paper Mario partners. The picture you mentioned is definitely official art for Superstar Saga, but yeah, a HD Mario RPG is well overdue. @Great_Gonzalez Hence your name? Haha. I love Paper Mario. I'm sad to see that they're fusing it with Mario and Luigi. I just don't think it will be all that good, and if it is, they popularity will probably be from the Mario and Luigi side. I'm afraid they'll downplay the Paper Mario elements after the failure of Sticker Star.